If you want to share large files between devices, then Bluetooth is not the best way to do it. You can use SHAREit app to transfer large files easily and at a much faster speed than that of Bluetooth transfer. The app is available for free for Android, iOS as well as Windows Phone and if you want to download SHAREit for PC, then you can do that using an Android emulator or get the official version of the app. In this article, we are going to list down the steps that you need to follow the download and install SHAREit for PC. There are many applications on the app store that allows cross-platform transfer of large files at blazing fast speed. We have previously shared a guide to download Xender for PC and since SHAREit is one of the most popular choices, we thought of making a tutorial to download Shareit for PC as well. 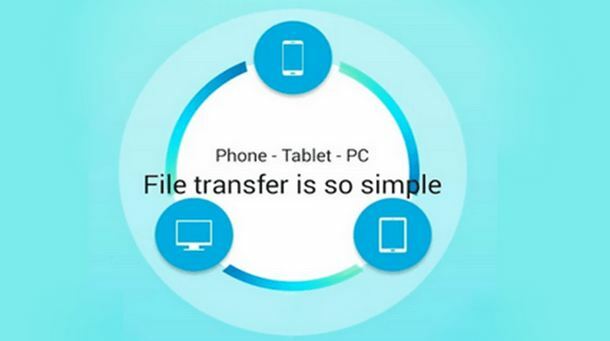 With the app installed, you can transfer huge files between devices and you don’t even need any Internet connection or data cables to do that. So, let’s see the steps that you need to follow to download, install and use ShareIt for PC. The application provides you a transfer speed of around 200 times that of Bluetooth transfer speed. So, if you are looking to transfer huge files, like 1 GB or so, then using ShareIt to do that would be much more effective. The app has been downloaded and used by over 300 million users from over 200 countries and the number is growing. So, if you too want to use SHAREit for computer or laptop, then you need to first download and install it. Free to Download: The app is completely free to download and use. Once you download it, there won’t be any limitations or restrictions on the app usage. Fast Transfer Speed: The transfer speed of ShareIt app is probably better than most of the other applications because it’s 200 times faster than Bluetooth and the speed can go as high as 20 MB/s. Cross-platform transfer: You can transfer files between any devices. The app supports Android, iOS, Windows Phone as well as Windows computer. Transfer Anything: With ShareIt application, you can transfer almost anything like photos, videos, music, contacts, installed apps and other files. The sharing is simply and extremely easy. CLONEit: This feature allows you to replicate contacts, SMS and MMS messages, music, videos, apps and other data from your previous old phone to a new one so that you don’t lose anything. There are 2 different ways to download SHAREit for computer. If you want the official version of the app, then you can download and install the .exe file but if you want to use Android app because of its easy to use interface, then you can download an emulator and install the app through it. We will see both the methods to download SHAREit app for PC, so you can go with whichever method you find the most easy. ShareIt app is available for Android, iOS and Windows Phone and can be downloaded from Google Play Store, iOS App Store and Windows app store respectively. But, if you want to download it on your computer or laptop running Windows XP, Vista, 7, 8, 8.1, then also you can download the official app from its website. Simply click on the following link to go to the official website and click on the download button as shown in the image below to download the .exe file of the app. Now, simply go to the folder where you saved the .exe file on your computer and double-click on it to run the installation wizard. Follow the steps and install Shareit for PC / computer or laptop. 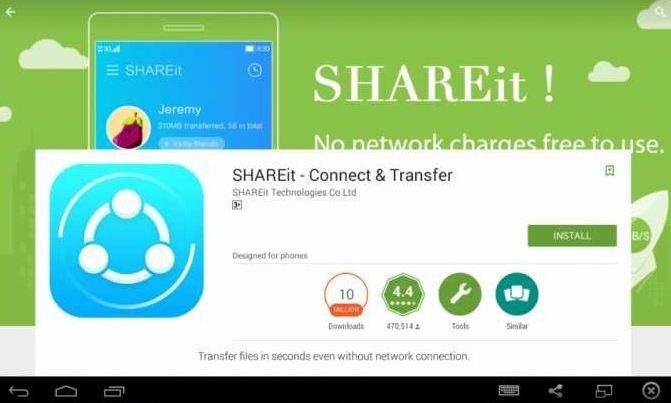 If you want to use the Android version of the file transfer app, then you can download and install the ShareIt APK file on your computer as well using an emulator. Launch BlueStacks and then type in “SHAREit” in the search box. From the search results, click on the Install button in the first result. Now, you will be given 3 options to download the app from. Click on the option from Google Play Store. If you choose Google Play store, then you will have to login to the store using your Google account. Once you are logged in, you will be redirected to the official Google Play Store page of the app. Finally, click on the Install button to begin the download process. The download process can take some time depending on the size of the app and the speed of your Internet or WiFi connection. Once download is complete, SHAREit for PC will be successfully installed. Now, go to BlueStacks once again and click on the “My Apps” tab. You will find all the apps installed on your computer and in this case, ShareIt app will be present there. Click on the icon to launch the file transfer app and start transferring huge files between your devices. These were the 2 methods that you can use to download SHAREit for computer. You can use any of these methods to get the file transfer app on your computer. I hope that you liked the article to download SHAREit for PC! If you liked it, then share it with your friends so that they too can transfer huge files between their computer and devices easily. Also, keep visiting DroidforPCDownload for more guides like SHAREit for PC!